Austrian rabbi; born at Prague Aug. 14, 1779; died there July 4, 1842. He was a son of Selig Trebitsch, ḥazzan at the Altneuschule, and he received a thorough Talmudical training at the yeshibah of Jacob Günsberg. Upon the recommendation of the "Landesrabbiner" Mordecai Benet (Marcus Benedict), Trebitsch became rabbi of Prossnitz in 1826. On May 13, 1832, the government confirmed the election of Trebitsch as "Landesrabbiner" of Moravia, in succession to Mordecai Benet, and granted him a salary of 600 florins; he was the last Moravian "Landesrabbiner" of the old school. In Sept., 1833, the provincial government issued a decree conferring upon the chief rabbi the power of proposing candidates for the various rabbinates of the province, and of making an appointment when the congregation failed to inform him of a vacancy or rejected the candidate proposed by the "Landesrabbiner." This decree, for which Trebitsch was declared by his opponents to be responsible, brought him into conflict with the congregations of Gewitsch, Weisskirchen, Prossnitz, and Loschitz; and five years later (May 23, 1838) another decree canceled the chief rabbi's privilege of proposing candidates. Abraham Neuda, rabbi of Loschitz, whom Trebitsch refused to confirm on account of liberal tendencies, was reinstated after having passed a successful examination before a committee of which Trebitsch was a member. This defeat, and the censure of the government for his opposition to the use of the German language among the Jews greatly affected Trebitsch, who died while on a journey to Carlsbad. 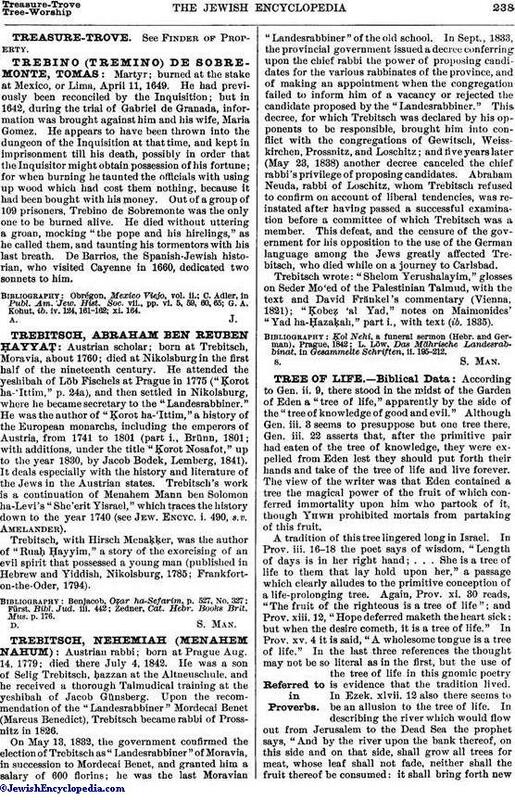 Trebitsch wrote: "Shelom Yerushalayim," glosses on Seder Mo'ed of the Palestinian Talmud, with the text and David Fränkel's commentary (Vienna, 1821); "Ḳobeẓ 'al Yad," notes on Maimonides' "Yad ha-Ḥazaḳah," part i., with text (ib. 1835). L. Löw, Das Mährische Landesrabbinat, in Gesammelte Schriften, ii. 195-212.